If you are a broker, realtor, or property manager we will alleviate your stress of storing and installing signs and posts. 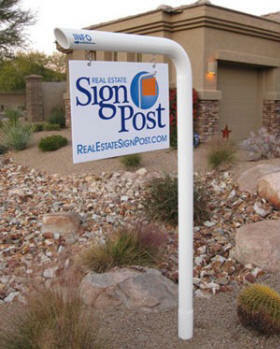 Real Estate Sign Post Company, Inc. is the fastest most reliable company you could choose to install your real estate sign posts throughout the greater Tucson area. We offer modern, solid posts that will enhance your marketing strategy for selling properties. We are a certified and exclusive Tucson, AZ dealer of the Quik-Post Systems™ product line. This allows us to offer a wide variety of functional and unique sign posts to fit any real estate application at competitive prices. Unlike other companies' unattractive, unnoticeable posts; our sign posts will catch the buyer's eyes with its height and sleek look. We are confident in our posts sturdiness and durability even during the windy monsoons months. Our rust free posts provide a bold fresh look that will add value to your personal sign and get your property noticed. Consistent and Quality Service Every Time! Our 24/7 online order management system allows unparalleled order accuracy and speed to minimize your administrative time, so you may spend your time on your primary job, selling properties. All of our installers are equipped with smart phones and stay in constant contact with our administrative staff. Installers have the ability to contact agents at any time and at your request. Immediately upon installation, our installers send you an email of the completed order. We strive for 100% customer satisfaction! If we neglect to properly install your order, you will not be charged any additional labor or trip fee. We look forward to working with you for all your sign post needs. If you have any questions, please feel free to contact our team. Website Copyright © 2008-2019 Real Estate Sign Post Company All Rights Reserved.